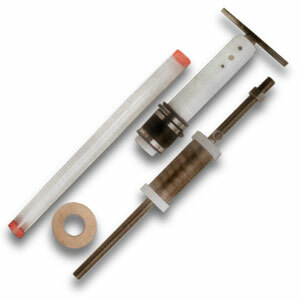 Recover high quality cores of water-sediment interface with this universal core head kit. The core head drives clear, virtually unbreakable polycarbonate barrels into sediments, resulting in long cores with minimal effort and sample compression. The one-way check valve permits the barrel to free flush during deployment and also retains the core sample, without using core catchers and nose-pieces. To obtain a sample, attach a polycarbonate core barrel to the core head and push or lower the sampler into the sediment. If sampling in compact deposits, use the optional slide hammer. To adjust sampler weight, use the bronze gravity weights (sold separately) for even easier penetration. Next, haul the sampler to the surface and insert a core extruding plug inside the barrel before the barrel breaks the surface. Loosen the rubber coupler sleeve and remove the barrel from the core head. With the core extruding plug in place, you can attach the barrel directly to the optional incremental core extruding apparatus (sold separately) which allows samples to be incrementally pushed from the bottom up if desired. In shallow water (less than 6 m), the sampler is manually-driven using the "T" handle and the optional aluminum extension rods. In deeper water, the corer is gravity/slide hammer-driven. Use separate lines for sampler deployment and slide hammer operation. Select the optional extensions for even deeper sampling. Universal core head kit contains polyethylene and stainless steel corer head, "T" handle, one clear polycarbonate core barrel (68 mm x 71 mm x 120 cm), two polycarbonate end caps, one core extruding plug, 15 m calibrated line with line reel, hexnut driver, carrying case, and directions.